A while back I published this post…. If you cant be bothered clicking on the above link, shame on YOU. Basically it went something like this…. Well, it turns out, that this is the first year they have allowed men to sign up! Not only is that pretty cool, whats even cooler, is that I was the FIRST man to sign up!…..NATIONWIDE!!! 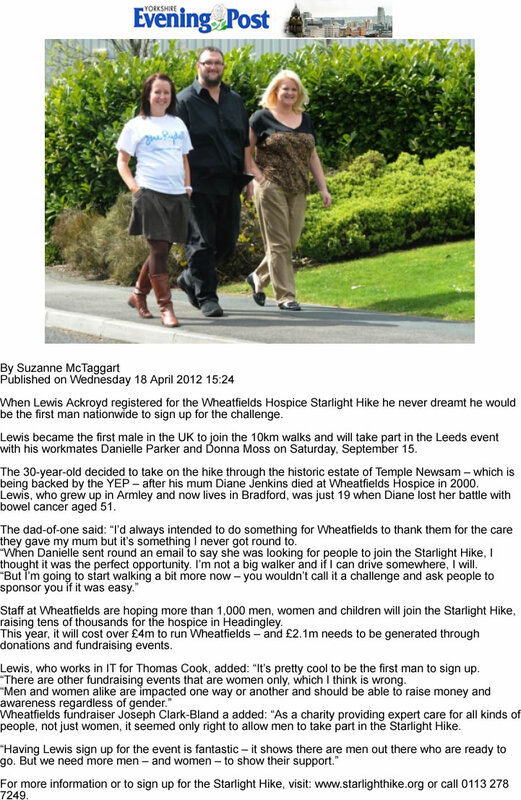 So from a few conversations with Wheatfields Hospice that included words such as “Publicity”, “Radio”, “TV” (Not counting on it) I then received a phone call from a journalist called Suzanne McTaggert from the Yorkshire Evening Post asking if I would be willing to be featured in the paper. Of course I said yes and then quicker than I can say face for radio, it happened! I’m famous!! Well I’m famous in Yorkshire…in fact no, I’m not famous at all, but its cool to be in the paper! So please, spare some cash. If each of my readers donated just £1 I would be a fiver closer to my target! And of course, if you feel the urge, sign up yourself! There is Starlight Hikes in Aberdeen, Dundee, Leeds, Clithroe, Haworth, Driffield, Bedford, Cheltenham, Ipswich, Peterborough and Reading. 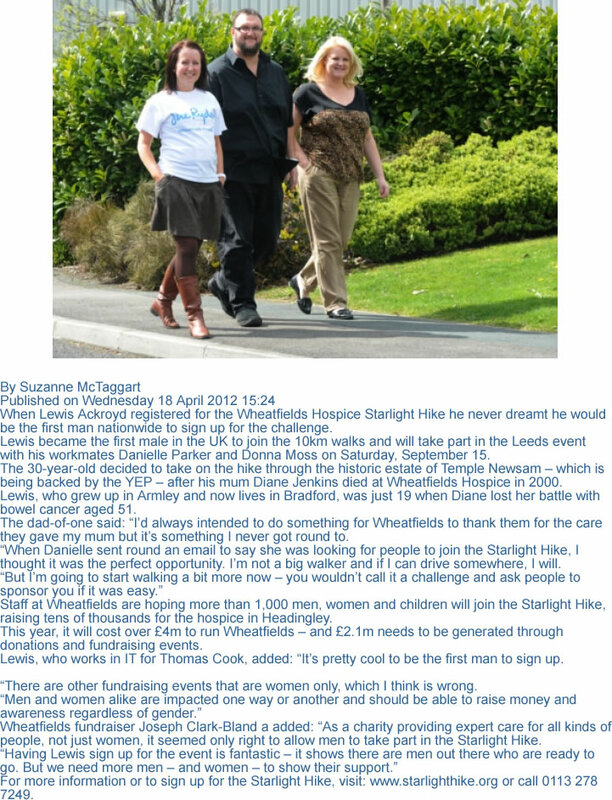 Go to www.starlighthike.org for more information or to sign up and of course please visit http://www.virginmoneygiving.com/LewisAckroyd To donate. Trust me, every penny makes a difference.